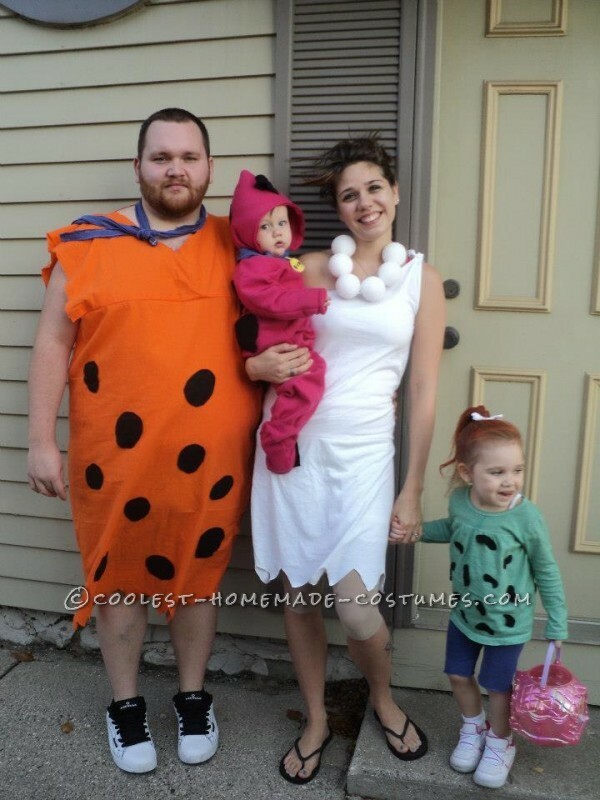 Meet the Flintstones. 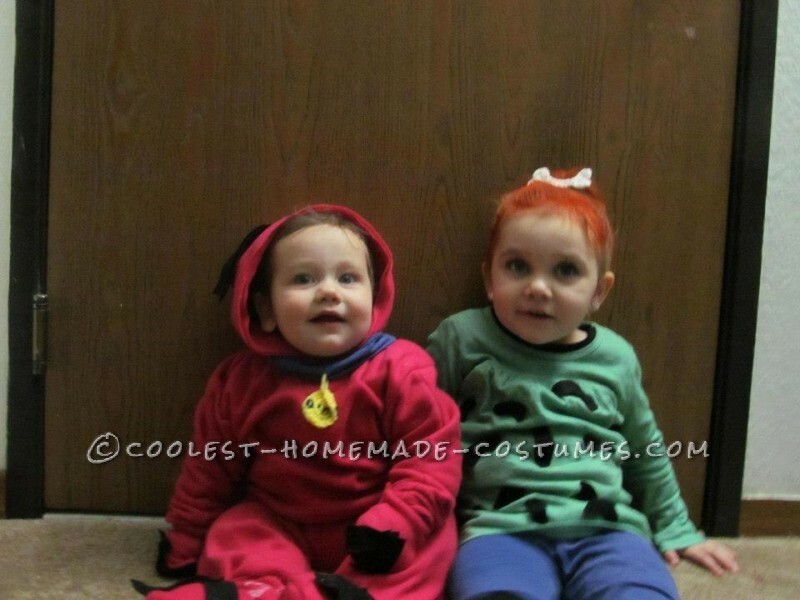 This family costume was created by using fleece for Dino and making it into footed pants and a sweatshirt. Also, there are mitts for his hands. Dino’s color came from t-shirt and was dyed. Dino’s tag was crocheted. Black spots were all hand cut and hand sewn from felt. Pebbles was made by dying a white shirt and shorts were made from a men’s white t-shirt. Bone in hair was crocheted and pinned into hair. Black spots were hand cut and hand sewn from felt. Fred was created from a large piece of orange material that was cut and sewn to size; tie was from t-shirt and dyed. Spots were hand cut and hand sewn from felt. Finally, Wilma came from 2 t-shirts (one for the top and one for the bottom) and sewn together. Necklace is made from Styrofoam balls. This was a fun family costume and it got a lot of positive reactions. We were addressed as the Flintstones and had a lot of fun. I am a stay at home mom so this costume took time to make while taking care of my kiddos as well as my little side business. 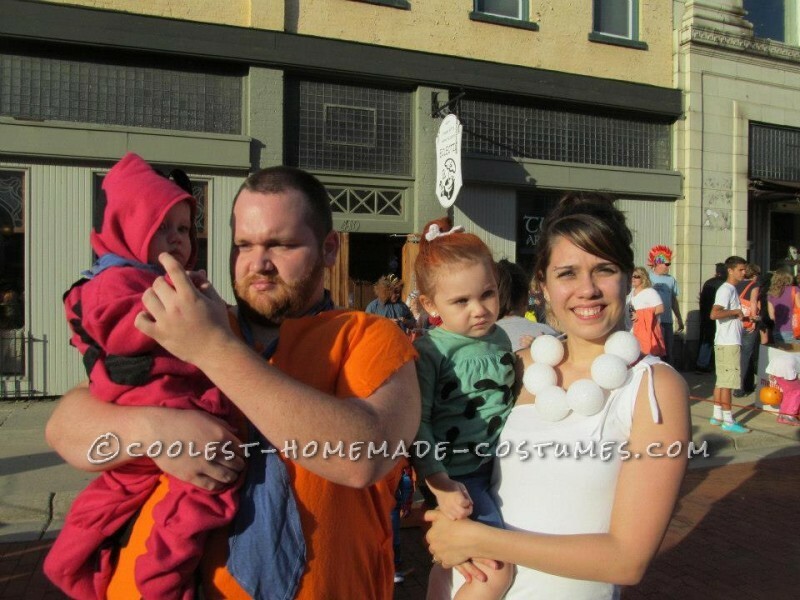 My daughter was very excited to be Pebbles and wanted to be called only by Pebbles on Halloween. Homemade costume idea posted by Tiffinie W.
Original Frankenstein Meets Hurricane Sandy Costume – Frankenstorm!